If you are thinking of buying a LED TV priced above Rs. 50000 then you can get a large Smart LED TV of display size 50, 55 or 65 inches and 4K Ultra HD resolution. In this article, we take a look at the best-LED TVs under 60000, 70000 & 80000 available in India as of March 2019. You will see LED TVs from all big brands like LG, Samsung, VU, Sony. We have covered a few curved LED TVs as well. The display sizes of above 50 inches provide a very immersive theatre like experience. The sound quality of these LED TVs is great. If you want more loudness or bass you can always connect external speakers. You can keep these LED TVs on a table or hang them on a wall. The display resolution of most LED TVs on this list is 4K Ultra HD which the best you can get. High resolution means the images look crisp with fine details. These LED TVs also have good contrast ratio and saturation levels. Viewing angles are also excellent in most of these LED TVs and even if you are watching from the sides, you will have a great viewing experience. Let's take a look at the list of best led tv under 60k, 70k and 80k. You will find a brief review of each LED TV with its pros cons, specs, features. Buy links to Flipkart and also provided. This is a Ultra HD 4K LED TV from Samsung's latest 2019 series of LED televisions and it is very well priced at just under Rs. 60000. A lot of new brands have come up in India which are offering 55 inch LED TVs under 40000 and 50000. Samsung's 55 inch TV was priced 2x of that so Samsung is trying to change things with this affordable series. The display is a 4K resolution 55-inch large panel with minimal bezels all around. The display gets very bright and has great viewing angles. You will just love the images on this panel. The display supports HDR and PurColour technology which means you get natural looking colors with good saturation and contrast. The audio of the TV is also decent. The output is 20W and there are 2 speakers. There's an option to add external speakers as well. It is a Smart TV and comes with pre-installed apps like Facebook, YouTube, Netflix. Connecting is to WIFI is super easy and the UI is intuitive as well. You can also use Samsung Cloud to seamlessly connect compatible smart devices to sync photos. Also, you can share mobile photos and put them up on your TV screen. The performance of this TV is impressive. If you have a budget of 60000 and need a 55 inch TV then this is the best you can get from Samsung. Sony products have great quality and are a bit expensive than other brands. Similar is the case with this 49 inch 4K Smart LED TV from Sony which is priced around 80000 while similar sizes from LG and Samsung will cost you around 50000 to 60000 and brands like VU, Mi will cost you around 35000. The 49-inch display panel on the TV is just beautiful. The color accuracy is good, clarity is great and viewing angles are decent as well. Combined with 4K Ultra HD resolution, HDR video content delivers exceptional detail, color, and contrast. As a result, pictures look lifelike and overall watching experience is excellent. The TV has Bass Reflex Speakers which provide a richer and deeper sound. Whether you love watching movies, sports or music, you will love the sound of this tv. Since it is an Android TV, you get all google apps like play store, google assistant etc. You can control the tv with your voice which comes in handy when you are eating food. With play store, you can install almost all of your favorites apps. Main apps like PrimeVideo, Netflix, YouTube come preinstalled. The remote provided with this TV can also control your DTH set-top box which is great because you can do everything with just 1 remote. If you have a budget of around Rs. 80000 to 90000 and Sony is one of your favorite brands, then go for this one. 58 inch 4K Smart TV at Rs. 50000? If wasn't believable couple of years ago and now plenty of options are available. This LED TV comes from the well-known brand Onida. The display panel of this led television is sharp and provides very detailed images. The viewing angles are great and the colors look natural. It is a treat to watch movies on this television. The TV is well built and feels durable. It has a brush steel finish on the bezels and the stand which looks nice. The TV comes with Android Oreo 8.0 and can be controlled with voice commands as well. It is a google certified tv and comes with Google Assistant preinstalled. Play store is also there so you install all your favorite apps on tv as well. It has 2.5GB RAM and 16GB storage which makes sure you get fluid and lag-free experience. For audio, we have Dolby sound support. The speaker output is 20W and the audio performance is decent overall. If you need more, you can always add a couple of external speakers. For connecting other external devices, there are 3 HDMI ports and 2 USB ports available. Overall, it is a great 4K Smart TV under Rs. 50000. Other options in this range include VU and Mi but they come with a 55-inch display which is a bit smaller than this one. iFFALCON is TCL's sub-brand of Smart televisions. This TV comes with a large 65-inch display which has a resolution of Ultra HD 4K. The tv comes with plenty of features such like Dolby Audio, True Color, UHD, HDR, and Google Voice Search is also there. The TV has a minimalistic design which looks great. Plus, the elegantly designed metal frame enhances the heat-radiating area while adding a hint of beauty to the overall design. Overall, this is an excellent 65 inch 4K LED TV under Rs. 70000. Aggressive pricing, great quality, good performance makes it one of the best 65-inch televisions on our list. LG, as we know, is the topmost brand in the electronics appliances and the products come at a cost because of the quality offered. This LG LED TV is branded as the LG AI ThinQ television and comes with a 49-inch IPS display having Ultra HD (4K) resolution with 3840 x 2160 pixels, the colour quality is brilliant and the scenes look original and sharp. The 4K resolution allows you to watch the videos, movies and other entertainment contents with great depth of colours and clarity. On the design side, this LG Ultra HD LED TV supports thin bezels at the periphery which adds to the great looks of the television, the build quality is solid as is evident from all the LG products and this LED TV is no different. With the ThinQ AI, this LED TV deploys NLP (Natural Language Processing) that provides great features based on your voice commands. The Smart LED TV also allows you to multitask by browsing while watching any TV show. Some of the features and functionality you can run with the voice commands are switching between channels, music, launching a gaming console, browsing the internet or even looking up for information about anything using internet and voice assistant, like the time at some place or the temperature etc. It even understands the command to switch off after the current program ends ensuring you sleep in peace and the tv does not remain on all over the night. There is a feature to share your mobile screen on Television and control(play games) with the TV remote or use other features. This LED TV is a smart TV which comes with support for all entertainment apps as well as the cloud photo and videos. Apart from the display quality and features, the sound quality is as important and this LED TV provides immersive quality without any external speakers as it uses the all-new DTS virtual X Technology. You can connect your LED TV with the mobile or either connect your TV to external speakers via 2 way Bluetooth. This LG LED TV has 3 HDMI and 1 USB ports which can be used to connect to the set-top box, gaming console, or external storage device. At a pricing of under 70000, this Smart LG LED TV offers a lot of new features and amazing quality making it a good value for money product. This is a premium LED TV from LG's 2018 edition TVs. It comes with Ultra HD 4K resolution(3840 x 2160p) which means you can see much more details compared to other Full HD resolution TVs. The display panel on this television is just gorgeous. It has Active HDR for an Enhanced Picture Quality. Movies and videos have lifelike colors, contrast, and saturation. HDR formats like HDR10 Pro and HLG Pro are included. It is a Smart TV and comes with a ton of latest features based on Artificial Intelligence. It has ThinQ AI for an Interactive Experience. You can control TV with voice commands. It uses Natural Language Processing to process your voice commands and control the TV. The TV comes with a Magic Remote. The Magic remote can be operated from any corner of the room. It also works as a universal remote so there is no need of multiple remotes. The TV has DTS VIRTUAL: X which means you are going to get rich sound experience without any external speakers. The refresh rate is 120Hz which is really good. Watching sports on this TV would be a great experience because of a high refresh rate. There are 3 HDMI ports and 2 USB ports available on this TV to connect external devices like set-top box, gaming console, pen drive, laptop etc. At a price of under Rs. 50000, it is a very impressive 4K LED TV packed with latest features and gorgeous display. Samsung offers master class products in the LED TV segment and this product is one of the best Samsung LED TV under 70000 with superb build quality and design. It is a 49 Inch LED TV with a 4K (Ultra HD) resolution and various display features like HDR which delivers the images with true to real life details, UHD Dimming which divides the screen into blocks to optimize colour, sharpness for a perfect contrast and viewing experience. It has a Slim Design to fit the best in your living room and beautify it. This comes with Smart View feature that allows you to cast your mobile to the big screen and enjoy the contents and Smart Hub feature that lets you collectively see the contents from the different provider as a thumbnail preview and navigate easily. Its remote control allows flipping the channels via voice control and is a Universal remote that can be used to control other home appliances as well. There are 2 speakers on this TV with a 20W output which uses Dolby Digital Plus technology to offer a great and improved audio experience. It has 3 HDMI and 2 USB ports for connecting multiple devices and comes with Warranty of 1 Year on Product and 1 Year Additional on Panel from Samsung. This is one of the best Samsung TV If you are looking for a Feature-rich, Smart and 4K TV under a budget of 70000. This LED TV is a part of Sony's most famous Bravia LED TV series. It is a 43 Inch TV with Ultra HD (4K) having a resolution of 3840 x 2160 which offers a perfect picture quality and minute details with 4K X-Reality Pro feature. To smoothly handle the fast-moving sequences, it has Motionflow XR feature that adds extra frames to offer blur-free experience. You can also enjoy HDR gaming using your PlayStation with the vivid and vibrant colours offered by this LED TV. It is a Smart TV with inbuilt wifi and support for various apps like YouTube, Netflix for you to enjoy the unlimited content with no hassle. It has 2 speakers (20 W output) which uses Dolby Digital, Dolby Digital Plus, S-force Front Sound Surround Technology and supported with a ClearAudio+ feature to provide an immersive experience of sound with great clarity and sharpness. In terms of design, this Sony LED TV scores high with a sleek design and narrow aluminum frame to enhance the beauty of your room. It has a unique stand design through which you can neatly arrange all the cables of TV and Set Top box. In terms of connectivity, It comes with multiple ports in form of 3 HDMI and 3 USB ports for you to connect multiple devices. Sony is known to offer the best display and clarity but at a cost which is higher than LED TV offered by companies like VU, Cloudwalker etc., so if you are looking for the best display and experience and are have a budget under 70000, this LED TV would be a good fit for you. You can check the 49 Inch variant of this LED TV here. If you have a big room or you are going to use the TV in the living room then 49 inch is a better option. It will cost you a bit more but it is worth it. 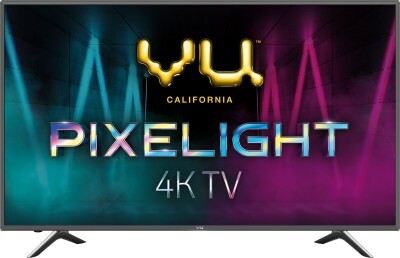 This is a 55 inch 4K LED TV from VU's latest 2019 Pixelight series of smart LED televisions. It has an Ultra HD 4K 55-inch display which comes with a resolution of 3840 x 2160 taking your viewing experience to an altogether different level. This LED TV is a Smart TV that runs on Android 8 Oreo operating system so you can enjoy the apps like Youtube, Prime Video, Netflix, etc giving you infinite options to stream entertainment content on your Television. VU has provided dedicated buttons on the remote to launch these apps with just a click. VU LED TV is powered by a Dual Core processor, 1GB of RAM and 4GB of internal storage. It has 3 HDMI and 2 USB ports for you to easily connect multiple devices. It has 2 speakers (built in soundbar) which offer 24 W output that uses Dolby and DTS technologies to give you an outstanding experience. The TV comes with Vu Upscaler technology which optimizes the settings depending on the type of content you are watching. Like if you are watching a football match then the sports mode will optimize the visual and upscale motion for sports programs. Gorgeous 4K display, good sound, plenty of smart features make if one of the best 55 inch 4K TV under 40000 in India. There has been a lot of hype around Mi TV 4 Pro. It comes at a price of around Rs. 50000 and offers a large 55-inch display of 4K resolution. It is a smart tv so you can connect it to your wifi and stream videos from the internet. One of the major positive about this television is the design. The TV is super sleek and looks gorgeous. The display is colorful and has good viewing angles. Because the display is so large, you should keep around 10 feet of viewing distance to get proper quality. If you have a small or medium size room, you should not buy a 55-inch tv. The sound output of the LED TV is average at best. You might need to add external speakers to get a good audio experience. The contrast is average as well. The black levels are not too dark. The software on this TV called Patchwall is still in initial stage so very few apps are available. This limits the Smart TV experience. You cannot use google apps or prime video even if you have Amazon Prime. If you want to save some money by spending less than 30000 then go for VU 49 inch Smart LED TV. See it on Flipkart. So that was our list of best LED TVs under 60000, 70000 and 80000 in India. We hope it was useful and you were able to find a suitable LED TV for your home or office. If you want to spend a little less, take a look at our list of best led tvs under 40000 in India.